Welcome To Our Complete Guide To The Best Chew Toys For Puppies. 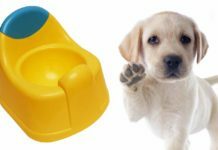 Helping You To Keep Your Teething Puppy Happy, Comfortable And Occupied During The Chewing Phase. Puppies love and need to chew. Chewing on objects is a normal part of growing up. Pups experience the world with their mouths, and get relief from teething by chewing. So it’s a popular pass time. But we don’t want our puppies to experience the world through our shoes, or look for teething relief in our pillows. So it’s important to give them an object that is appropriate for them to chew. 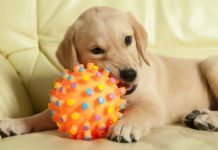 Here are some of our top choices when it comes to the best chew toys for puppies. We’ll look at these and lots more great options in the article below. 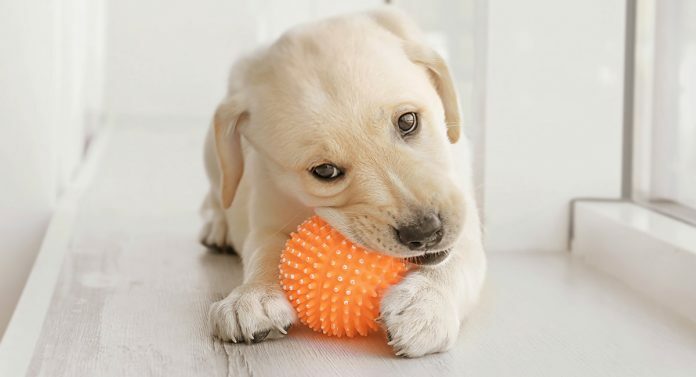 Because your dog will be chewing on it, the best teething toys for puppies are durable and non-toxic. Inexpensive toys may be tempting for budget conscious folks, but cheaply-made pet toys can contain toxins like BPA or even lead in some cases! The poor durability of these cheaply made pet toys means they can result in pain for your pup. 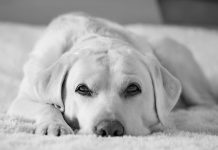 A few could even cause serious damage if your pup ingests pieces. 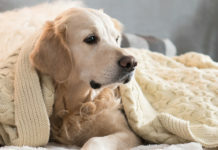 It’s important to choose appropriate chew toys for puppies rather than giving them a toy that was made for a human child, as those aren’t meant to be chewed on and are easily destroyed by a teething pup. For this reason it’s best to shop for purpose-made puppy toys from reputable brands. Ideally those with lots of positive reviews from conscienscious puppy owners. But what are the best chew toys for puppies out of those brands? And come to think of it, which brands are we referring to? We’ll be breaking the options down into categories, to help you find the type of toy you think will suit your pup best. Hard nylon toys like Nylabones give pups something to safely bite and tug on. A Nylabone Puppy Twin Pack is a great way to give a puppy two versions of a tried-and-true chew toy with rave reviews. This starter pack includes two of the best chew toys for teething puppies. A hard nubbed chew toy that rubs the gums to ease pain during teething, and softer bone for the youngest chewers. The starter pack is made in the USA and designed for pups that don’t yet have their adult teeth. It’s widely agreed that some of the best chew toys for puppies are made by the Kong brand. 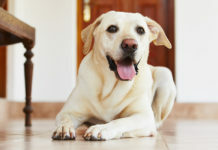 Activity-based, distraction chew toys like Kongs, can exercise a dog’s brain as much as their mouth. Keeping them entertained for a long time and helping them to chill out too. Rubber Kongs are considered the go-to chew toy by many dog lovers, but the standard sizes are likely too big for little puppy mouths. Fortunately they also do some great small puppy chews. The best-selling Puppy Kong is a durable rubber chew and treat toy that is appropriately sized for puppies. The open center is perfect for holding treats like peanut butter and a couple hours in the freezer turns these into perfect frozen puppy teething toys. Puppy Kongs can take a good chewing, and stand up to even the most powerful puppy. The Kong Puppy Goodie Bone Treat Toy with Rope is available in extra small for the tiniest of pups. It is also great for active play between pup and their owner. The Kong Goodie Bone has the addition of floss rope makes it a perfect tug-of-war toy. The rope cleans pups teeth while they play and it is made in the USA of nontoxic natural rubber. The bone-shaped design allows small pups to get their mouth around it while the treat-holding ends serve the same purpose as a standard Kong’s hollow center. They are good for chewing sessions with our without treats. The super durable rubber holds up to puppies that already have some power to their bite. The tire shape is tons of fun for puppy to flip with his paws and mouth. Chewing it out on Amazon here. You can’t get much more natural than a chew toy straight from nature. Hard puppy toys can be great for teething puppies too. And you can’t get much harder than an elk antler. These elk antlers come in a range of sizes, so you can pick one that’s the perfect size for your pup. Probably the small or medium. 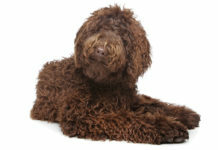 It is a great, natural way to keep your chewy puppy happy. One of the benefits of Kong products is that you can freeze treats in them. This makes the chewing and treating last longer. It is also soothing to teething gums in small puppies. But they aren’t the only brand that make these great toys. The Nylabone Romp ‘N Chomp Freezer Bone is a safe, durable toy that is made specifically to be frozen. You can freeze everything from water to mashed banana in the bone’s treat reservoir. Or use Kong’s own squeezable stuffing. Teething pups enjoy the cooling sensation on their gums. 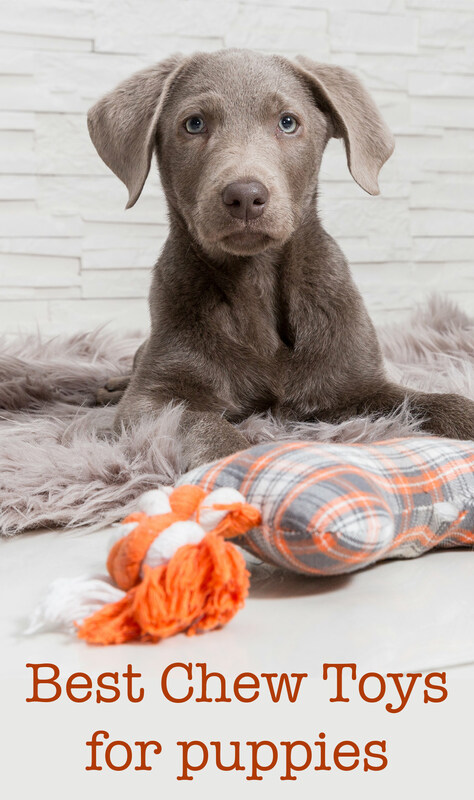 The best kind of toys for puppies to chew on are good for their gums, and the Nylabone Puppy Chew Toy is just that. It’s a great chew toy for small puppies and the nubbed surface provides massaging gum relief during a puppy’s teething period. This friction also helps keep a puppy’s teeth clean while they grow, preventing plaque and tartar buildup. The PetSafe Busy Buddy Twist ‘n Treat Puppy Toy is one of the best toys for very young puppies as it is gentle on puppy teeth. This toy can be filled with kibble or treats to engage your pup in active play. The opening for the treats can be made wider or smaller depending on your pup’s treat getting abilities. Rope toys are another of the best chew toys for puppies. They have plenty of places for grabbing hold, and can help to keep their teeth clean too. These fun toys are also great for games of tug. This set of four different ropes is perfect for teething pups. There are a few ways of finding soft chew toys for puppies. One is to go to the softer end of the solid chew toy scale. The other is to look for soft toys for him to chew. If all of the above chew toys for puppies seem too hard for your pup, try the Just for Puppies Chew Toy from Nylabone. It is made with softer material and designed for teething pups. This soft puppy chew toy has raised bristles on one end that help clean teeth and prevent tartar buildup. The toy is best for puppies who aren’t yet powerful chewers, and will need to be replaced with something harder when your pup gets stronger. But when it comes to soft chew toys for puppies, it’s hard to beat! Nothing says soft like a teddy. The Kong Cozies are a great range of soft chew toys for puppies. They are cute, soft and cuddly. But they are also reinforced. This means that they can stand up to mild chewing from your pup. One of the best chew toys for puppies in our dogs’ opinions are those which are edible. Obviously you need to limit these for health reasons, but they can make a great addition to your pup’s chew box! Nylabone Healthy Edibles Puppy Chew Treats are great for those times when you want your puppy to have both a treat and a toy. The hard turkey and sweet potato puppy treats are make in the USA and contain DHA to support healthy eye development. The N-Bone Puppy Teething Ring is another popular edible choice. A made in the USA product, these rings are digestible and made with extra calcium for bones and your puppy’s growing teeth. They’re fortified with Omega 3 Fatty Acids and customers say they keep pups busy for hours. Nature Gnaws Braided Bully Sticks are made from all-natural, free-range, grass-fed beef. They are very hard and take pups a long time to chew through. Great for keeping busy jaws occupied! They are digestible and a good alternative to rawhide too. As you can see, there are a wide variety of different types of puppy chew toy. But, what are the best chew toys for puppies? And which one is your dog going to get the most out of? For most young dogs, the best chew toys for puppies are those that are easy to chew, yet long lasting. Will work their jaws, but be gentle on sensitive gums. And they will be appealing to your puppy too. The Romp and Chomp toy is no longer available. Is there another frozen toy you can recommend d besides Kong? ?